These little babies are really good and easy to make. Can always have them on hand for company or just whip 'em up in no time. Cut each pie crust circle into quarters. Reshape the dough into rounds, and press one piece of dough into each of the eight tart pans. Place on a cookie sheet; set aside. Whisk together the eggs, sugar, corn syrup and melted butter until smooth. Stir in the chopped pecans and chopped SNICKERS® Brand FUN SIZE®. Divide the mixture equally between the tart pans. Bake the tarts for 25-30 minutes, or until bubbly or golden brown. Transfer the tarts to a wire rack, and let cool completely before removing from the pans. Before serving, cut 2 unwrapped SNICKERS® Brand FUN SIZE® into 4 pieces each. 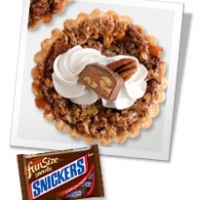 Decorate each tart with a dollop of whipped cream, a pecan half and a SNICKERS® Brand FUN SIZE® piece. TIP: This recipe also can be made as a 9-inch tart. Just line a tart pan with one pie crust circle, and fill it with the pecan & caramel mixture. 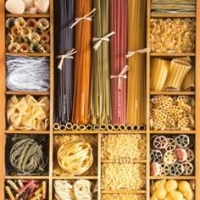 Bake in a 350-degree oven for 45 minutes, or until bubbly or golden brown. Cool before decorating with eight dollops of cream, a pecan half and a SNICKERS® Brand FUN SIZE® piece. This is my favored type of tarts.Thank you so much for sharing.Saved.. Impossible to resist...Thank you for the fabulous idea! Sounds great! Its lika a pie and a candy bar in one fun bite!! !